4i Apps starts implementation of Oracle PSRM – Public Sector Revenue Management for a county in Africa. With Oracle Certified consultants in PSRM, 4i joins the league of niche players offering PSRM solution. 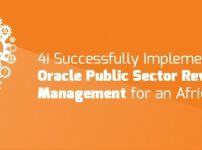 Oracle PSRM is the perfect solution for managing counties, provinces ,municipalites etc.. Oracle PSRM combined with Oracle E-Business Suite provides a comprehensive solution for Public Authorities/Counties. OUAF framework available within PSRM helps customize and extend the PSRM to develop public authorities unique requirements. Using Oracle SOA , PSRM can be integrated tightly with E-Business Suite for an Integrated experience. Previously known as Oracle Tax Applications, Oracle Public Sector Revenue Management is specifically designed to support the challenges of tax and revenue administrations worldwide. It is a secure, tax-specific, commercial off-the-shelf (COTS) software solution that enables tax and revenue administrations to optimize all aspects of the revenue collection process and quickly respond to tax law and regulatory changes. Hi Did this PSRM Implementation Project has been started ? How long did u take to deliver this project?